Here is a photo that I took some time ago in our garden. 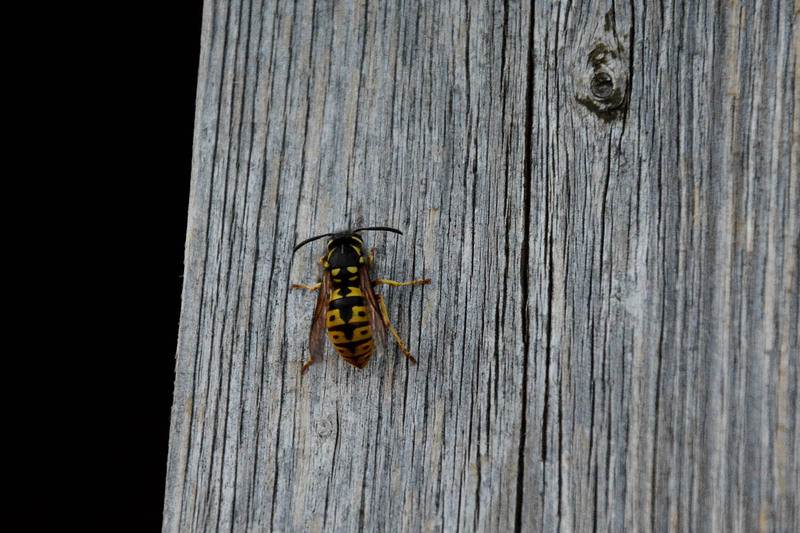 I noticed a wasp on a wooden beam and thought I take the photo. I took a lot of inscent photos back then when I was still using my point and shoot camera. That worked quite well back then because it had some kind of pseudo-macro mode. It’s a lot more difficult with my DSLR due to the focus distance limits and I didn’t invest into a macro lens yet. Maybe I do in the future because I am interested, although it’s nowhere at the top of my priority list. I know there are other ways to take macro photos, like converters and what not, but I am not interested in workarounds yet. Unless you are going to do a lot of shooting of flowers and other small things, a macro lens isn’t always good investment. They are tricky to use and very limited in scope. There are other lenses that have a “sort of” macro on it. I have a “normal” lens that has a macro button on it that does a pretty decent job and you can get very close using a wide angle lens too — and a wide angle has other uses, like for scenery. Think about what you like doing before you spend a lot of money on something you may only use very rarely. Yes, that turned me off from the whole idea back then. I’ve seen a lot of videos on how to work with these lenses. And as creative you can become with macro lenses, it really appears to be very limiting and as you said, very tricky to work with. I still will get one at some point, probably a Sigma 105mm Macro, but it’s not really priority and can wait a few years. It could be that I know what you mean. When I once mentioned in a community that I’d like to be able to focus closer on my guitar neck when I record videos, someone suggested me to get a certain 40mm lens which has a lot smaller minimum focus distance compared to my 50mm if I remember right. Talkin about real macro lenses again… I’d be fine to spend money on it even if I use it barely, but just because I have no issue with buying second hand lenses. They’re not super expensive if it’s a used one from local classifieds or Ebay. And I think most photographers take care about their gear. At least I had good experience with my used 50mm purchase. But then again… it can wait. Absolutely not priority now.